A high percentage of those killed in battle in WW I were never identified, and just one of those was chosen to be buried with the highest honour as an Everyman. Even the battlefield where he was found was kept secret. In the end the choice came down between six unknowns who were draped in union jacks and laid in a chapel. Two high ranking officers went in. 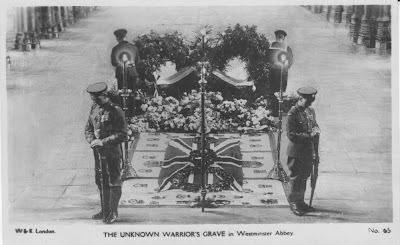 The highest ranking General rested his hand on one of the bodies and they placed that body in a plain coffin to be buried among all the Kings and Great people with great ceremony at Westminster Abbey. Those same generals sent possibly hundreds of thousands of unknowns - unknown to them that is - off to the fields that were later covered in poppies.